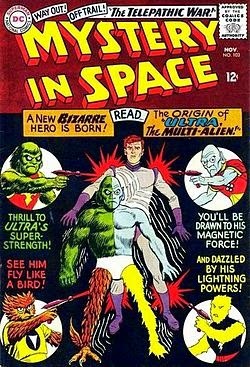 With his first appearance in DC Comics Mystery in Space #103 for November of 1965,Ultra the Multi-Alien pushed out both long-time space heroes Adam Strange and Space Ranger from that anthology title. Created by writer Dave Wood and artist Lee Elias, Ultra was originally Earth spaceman Ace Arn, living in an future era when spaceflight was commonplace. After crash landing on a planet in a far off solar system, he was attacked by four aliens, each a member of a different species from their respective planets Ulla, Laroo, Trago, and Raagan. The four aliens simultaneously shot him with ray guns designed to transform him into an obedient member of their respective species. Because all four rays hit him at the same time, he was instead transformed into a combination of the four aliens, but free of their control. The upper right section of his body grew green fur and gained super strength; the upper left section turned blue and gained magnetic powers; his right leg grew feathers and small wings, giving him the ability to fly; and his left leg was transformed into a bolt of lightning. He combined the first letter of the worlds the four aliens were from, along with the first letter of his name to come up with: U-L-T-R-A, his new name. He soon finds a device to convert back to human form, giving him a secret identity. 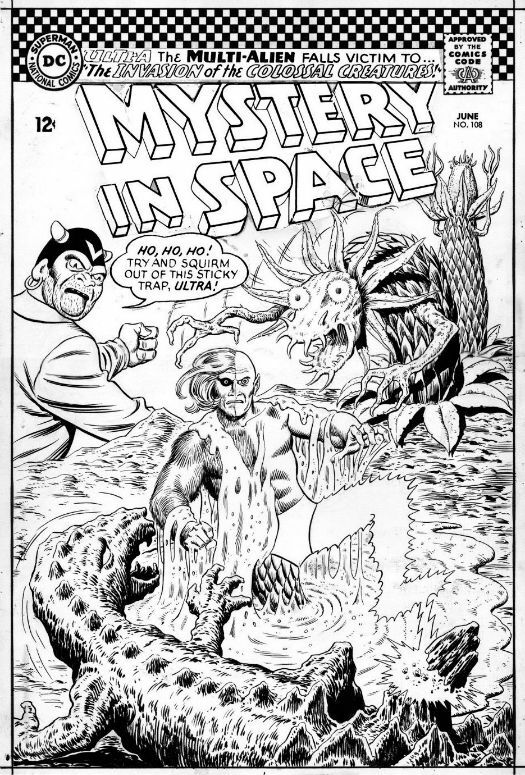 His series lasted until issue #110, September of 1966, when Mystery in Space was cancelled. He would not reappear for several years again in the DC Universe and occasionally pops up in titles still today.